Originally published on July 5, we look back at our preview of the Boilermakers from the summer. Purdue has opened its season 1-3 but head coach Jeff Brohm's bunch lost all three right out of the gate by a combined eight points. First it was a 31-27 loss to Northwestern that featured a personal foul penalty on Purdue's defense late in the game, one that turned a third-down stop into a first down for the Wildcats. Sound familiar? Then it was a 20-19 loss to Eastern Michigan on a field goal as time expired. The Boilermakers racked up 467 yards of total offense but fumbled the ball five times (losing two of them). The third loss came at home against Missouri, 40-37, in a game where quarterback David Blough threw for 572 yards and three touchdowns. The Tigers kicked a field goal as time expired. Purdue entered Game 4 in almost an identical situation to Nebraska. Winless, facing a must-win against a good football team. Brohm's group responded by picking off then-23rd-ranked Boston College four times, holding superstar running back AJ Dillion to 59 yards on 19 carries (432 yards in his first three games), getting another 296 yards and three scores through the air from Blough and winning 30-13. 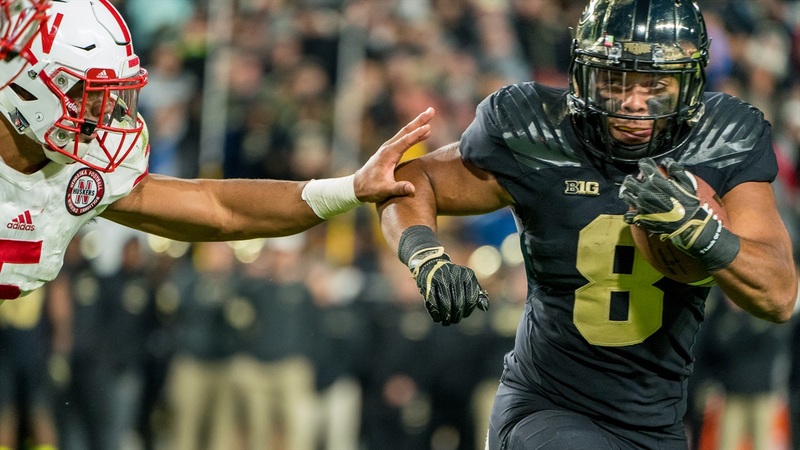 The Boilermaker defense was a question mark heading into this season and after a rough first three weeks, they looked much better against the Eagles. Still, the defense ranks 81st in success rate through four games. While the rushing attack carried the load offensively in 2017, the passing game has been the main fuel for 2018. Purdue is throwing it on standard downs 53.5 percent of the time and throwing it on passing downs 76.5 percent of the time. Both rank towards the top of national leaderboards. Blough has been efficient (70.1 percent completion rate, 6:1 touchdown-to-interception ratio) but he's carrying a heavy workload. And, of course, no Purdue preview would be complete without mentioning the Boilermakers' breakout star in freshman wideout Rondale Moore. Brohm has him returning kicks, running jet sweeps and catching deep passes. Moore is being targeted on 29.3 percent of Purdue's passes this season and only one other guy in the country has more 30-yard gains this season than Moore's six. The Huskers and Boilermakers kick off at 2:30 p.m. CT on BTN. The guy from Western Michigan stole the headlines when Minnesota hired him to be its next head coach; the guy from Western Kentucky wasn’t as splashy. Then the new Minnesota guy stole the show when he was introduced to the rest of the Big Ten during media days; the new Purdue guy wasn’t as flashy. Then the whistles blew and the footballs flew and by the end of the 2017 season, all anyone could talk about was the transformation taking place in West Lafayette under Jeff Brohm. Purdue is fun again. The Boilermakers shocked the conference turning 3-9 into 7-6 a season ago — a very competitive 7-6 one should add — and Brohm is back for 2018 (after kinda-sorta-not-really flirting with the Tennessee job) hoping to continue the ascent. Purdue will probably be a trendy pick in the Big Ten West in 2018. For the rage-against-the-machine crowd that’s never sold on Northwestern and a year away from joining the corn craze, the Brohm Bunch should get a ton of dedicated ink (or… type, I guess) before this season kicks off. ESPN’s FPI has them at 47th but predicted to go 5-7 largely thanks to the fact they’ll play what ESPN is calling the seventh-toughest schedule in the country. So, on why the turnaround happened. It was because the defense went from “meh” to “holy crap,” like, really freakin’ fast. Last year’s unit ranked eighth in yards per point, 22nd in rushing yards per play, 57th in explosive play percentage and 63rd in passing yards per play. It went from 107th in success rate in 2016 to 21st; it went from 105th in IsoPPP+ to 64th; it went from 123rd in rushing S&P+ to 6th. That’s like 0-12 to 13-0 but instead of in two seasons it happens with the snap of a finger. That points directly to coaching. Brohm and company were that good last season. That’s it. Two guys. The rest will be guys filling new roles. Both of last year’s starting corners — Josh Okonye and Da’Wan Hunte — are gone and they took 75 tackles and 17 pass breakups with them. That defense was the muscle that held up a struggling offense. The good news is Brohm’s history suggests an offensive bump is coming to try and keep things from tipping over. While Western Kentucky was about eating up yards through the air, Purdue was better grinding them out on the ground. The Boilermakers went from dead last in the conference in rushing yards per play (4.06) in 2016 to fourth last year (5.28). In all the run metrics, Purdue was a top-tier team. It ranked 13th in the country in adjusted line yards — ahead of teams like Wisconsin (18th) and Michigan (20th) and only one spot behind Georgia. It sat at 17th in opportunity rate, picking up 5 yards on the ground when available 42.9 percent of the time, and was only stopped at the line of scrimmage on 17.3 percent of runs (33rd nationally). Passing the ball efficiently wasn’t a thing (93rd in passing yards per play) but that will happen when you cycle back and forth between two different quarterbacks all season and one of those quarterbacks plays on a torn ACL. Elijah Sindelar (the one who played hurt) and David Blough are both back and when Sindelar gets fully healthy, he’ll likely be the guy. Most of his weapons will rejoin him then. Of the eight guys that saw 25 targets or more in the passing game, six are back. Both tight ends — Cole Herdmen and Brycen Hopkins — return after finishing second (16.6) and third (14.0) on the team in yards per catch. Each of the top four backs from a season ago return, with senior DJ Knox looking like he might be the leader of the group while a redshirt freshman used a strong spring to punch his way into the mix as well. Add a few highly-rated wideout recruits to the mix and there’s a feeling of optimism in West Lafayette that things get clicking this year. Four of the five starters up front from a season ago are back and that means virtually the entire rushing attack returns; there shouldn’t be any regression there. Odds are the passing improves as well given increased system familiarity and (hopefully) quarterback health. Those are all good things. They need to be. Brohm gets Northwestern, Ohio State, Iowa and Wisconsin all at home with Michigan State and Nebraska highlighting the road schedule. Of the two losses at home last season, Nebraska won by a single point thanks to a go-ahead score from Stanley Morgan Jr. in the final minute and Michigan pulled away in the fourth quarter after struggling to a 14-10 scoreline through three. Long story short, they were tough at home. They dropped six games during regular-season play but had losses by one point, two points, seven and eight. Purdue won’t sneak up on teams in 2018 the way they might have in 2017 but that doesn’t mean opponents won’t have to earn it against the Boilermakers each and every Saturday. Purdue overachieved in 2017 after a three-win prediction. If they do so again in 2018, it’ll either be because A) The coaching staff is just a really good one and defense will be more reload than rebuild, or B) The offense took that Western Kentucky-like leap. It’s likely you’ll see signs of progress even if the team doesn’t exceed that five-win threshold. Either way, it’s fun to say it: the Boilermakers are relevant again.